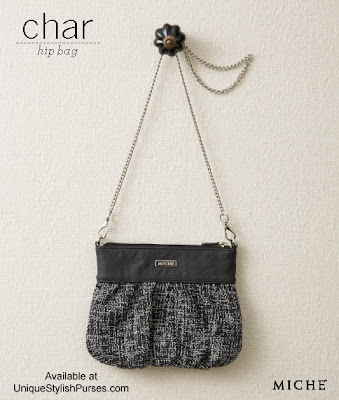 The Char Hip Bag combines the timeless elegance of tweed with modern styling to create the ideal take-anywhere accessory for the woman on the go. Black and white tweed fabric features black faux leather collar and long chain handle. Bag is completely self-contained—it is not interchangeable like our traditional bags. Interior has three credit card slots and zipped pocket. Zipper closure. Length: 10”; height: 7.75”; handle width: .75”; handle drop: 22”.